BATTLE GROUND — To help raise funds for activities that benefit the local community, the Battle Ground Lions club will host its first annual “Crabaganza” crab feed on Sat., Jan. 20. According to Ken Steinke, membership chairman for the Battle Ground Lions, Lions clubs around the world support their local communities under the mission statement of “we serve.” The organization works to help communities through sight and hearing conservation and awareness, diabetes awareness and supporting various local organizations and other causes. Steinke said that the Battle Ground Lions are heavily involved in Clark County’s annual Walk and Knock event which provides food, money and supplies to benefit the Clark County Food bank. The club is also involved with local schools. According to Steinke, the Lions organization has a mobile trailer that travels to various schools and screens children for sight and hearing issues. This outreach alone helps screen 3000 to 5000 children annually in the Battle Ground school district. The Battle Ground Lions also work to support a local Boy Scout troop, as well as the Rocksolid Community Teen Center and the Battle Ground High School ROTC program. As part of the club’s community involvement, Steinke said that the Battle Ground chapter is working with the Battle Ground Community Library to install sound deadening material in the building. To help the club support its mission of serving the community, Steinke said that the Lions will host the first annual crab feed at the Battle Ground Community Center on Sat., Jan. 20. The crab feed is designed to supplement the Battle Ground Lions’ annual fireworks stand fundraiser held during the summer. Steinke said that the inspiration for the crab feed came from a similar event put on by the Wilsonville chapter of Shriners International, and a representative from that organization is helping organize the crab feed. After Steinke and his wife attended the Shriners crab feed, they realized that there was no such activity in the Battle Ground area, and hosting it at the end of January would give people something to do during the less active winter months. “It’s a fun even and it would be a good fundraiser,” Steinke realized. Steinke said that in addition to the main crab dish, attendees will have the option to choose chicken as an alternative main course. The event will also have a no host beer and wine bar. Attendees can also participate in a raffle at the crab feed. Small groups are encouraged to sign up, and one of the main goals of the crab feed is “just to get people together and visit,” Steinke said. According to Steinke, the funds raised from this event are not earmarked for any specific project, although he noted that some always go to support sight and hearing preservation efforts and that some of the funds will likely be allocated to support the library sound deadening project. 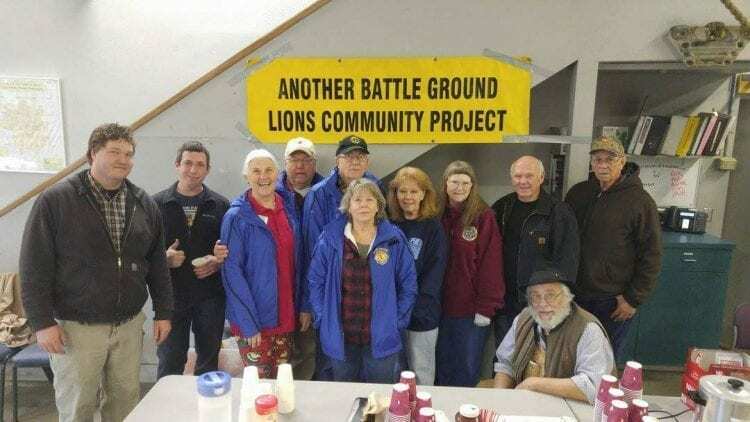 Members of the Battle Ground Lions, as well as people outside of the group, are free to approach the organization with proposals of projects or organizations that could use the support of the club. “Any money that comes in from a community project goes back into the community,” Steinke said. For the crab feed, doors will open at 5 p.m. and food will be served at 6 p.m. The cost is $40 per person, and tickets must be purchased in advance, as no tickets will be available at the door. Tickets can be ordered online at http://www.bglions.org/, via email at bglionsclub@yahoo.com or by calling Bev Jones at 360-798-9764.